Wouls you like to visit the Wave Rock in Hyden, Australia? According to scientists, this stunning stone formation is 2700 millions years old. Because of its peculiar shape; the Wave Rock has been an important spiritual center for the aborigine Australian people. The Wave Rock is also the site of beautiful Indigenous rock art. It's a breathtaking sight absolutely. Be sure to be there at night. Some of the best star gazing around. It's amazing. No worries mate. Pretty sure there's a mob there who were building an actual star gazinh lounge, (or at peast had plans for one). The same mob runs 2 day tours of the area and well worth it. Plis Mick Taylor isn't real so while you over gotta visit the Wolfe Creek crator. Also amazing rock formations a lot farther north at the Bungle Bungles, (https://www. australia. com/en/places/broome-and-surrounds/guide-to-purnululu-national-park. html). Can't miss the Kimberley region. Wow, you bet I would like to go and take my girlfriend there with me. Great find. I'm inspired to find interesting places to travel with my boyfriend. If you were stuck on an island, how long do you think you'd be able to survive? Which is the best and worst airlines according to you? Russia or China? Do you ever get out of the city? Do you ride dirt bikes or ATC's? What is your poison? How far from home would you move away for love? When people ask, "Would you like to visit..." the answer is invariably yes. I can't recall a place I would not like to visit, including hell. I've never heard of the wave rock till now and yes I'd love to go see it. That thing is 2.7 billion years old? I would love to visit! That does look cool. I would like to know how it formed. It´s weird but beautiful and I sure would like to visit. A massive lava wave that froze in place before crashing and breaking, and still intact after 2.7 Billion Years... that's bloody impressive! Travelled to a lot of places, but not yet to Oz, that looks like an awesome place to visit! That is one of the coolest things I've seen this week. Never heard of it. That's awesome! I'll go. as, long. as rocks don't off at you. 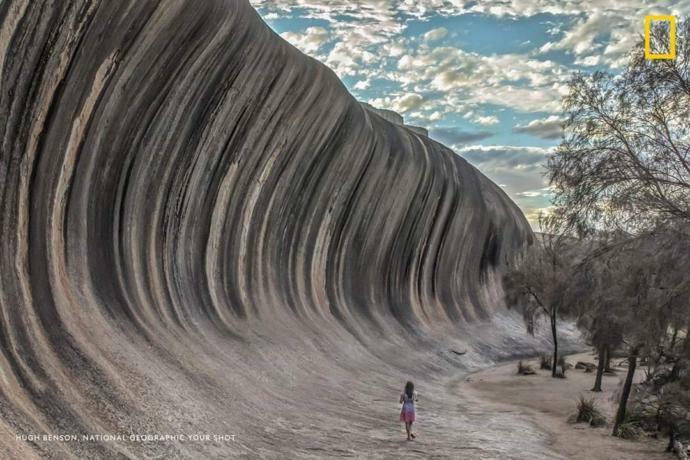 Home > Travel & Leisure > Wouls you like to visit the Wave Rock in Hyden, Australia?